Solskjaer’s United side hosted the perennial Spanish champions in the first leg of the Champions league quarter final on Wednesday. For United, the incredible run of results which culminated in a remarkable comeback in the previous round against PSG had been replaced by, 3 defeats in the last 4 games. Their opponents meanwhile, came into the clash on the back of 9 wins in their last 10. The away side were able to settle quickly into their possession rhythm and control the opening stages of the game. This was partly due to United’s approach without the ball. From their base 5-3-2 structure, United’s 8s (McTominay and Pogba) would move a line higher when in midfield/high pressing phases, making a narrower 5-1-2-2. The height of Young and Dalot’s positions was based on how high Barcelona’s full-back pair moved upfield. United’s strike pair were mainly focused on blocking the 6 space by staying narrow and reducing the size of the channel between them as much as possible. The general aim against the Catalan side’s build-up appeared to be, using the strike pair and 8s to block Barcelona’s midfield trio, conditioning early passes to Semedo and Alba, which they could attack and force backwards with Dalot and Young moving up. A key part would be the strikers’ ability to combine blocking dribbling paths for Pique and Lenglet, with covering the 6 space. However, the interaction between the structures led to some difficulties in executing this plan. With Coutinho high and wide position on the left, he was able to pin Young back from pressing Alba. On the right side this was done mostly through Semedo moving high and wide, preventing Dalot joining the press. Rakitic or Messi could now receive with more time in these spaces, with the other pinning Pogba back by staying high behind him. Additionally, Busquets or Rakitic constantly dropped into the defensive line, creating a temporary back 3. One major effect was Pique and Lenglet now having more freedom to dribble into the space ahead of them, with the extra cover given. In response, Lukaku often stayed higher on the left, preventing passes from the centre of the back 3 to Pique on the right, as well as directing play away from Messi. Barcelona thus started most of their build up on the left, where they could find Alba with time whilst United waited for McTominay to move across and press him. From here they would often switch either through Arthur or Busquets in the 6 space, or through the defensive line in moments where Rashford/Lukaku focused on blocking back passes to Lenglet. In these situations, they could find Rakitic or Messi with time & space on the right side, whilst United’s midfield 3 worked their way across. With these constant half space switches they gradually moved the home side deeper, using the areas either side of Pogba and McTominay as the basis to control the game. 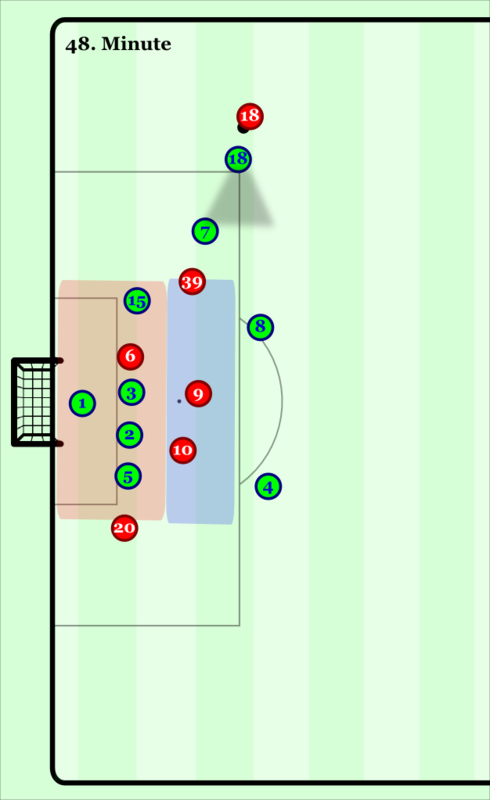 Visualisation of the spaces Barcelona targeted, and some of the movements they used. Once United had been moved into deeper defending in their half, the away side’s final 3rdapproach followed a similar principle to the build-up. Offensively, they focused on playing around United’s midfield 3 with half space switches and overlapping runs from Alba & Semedo. 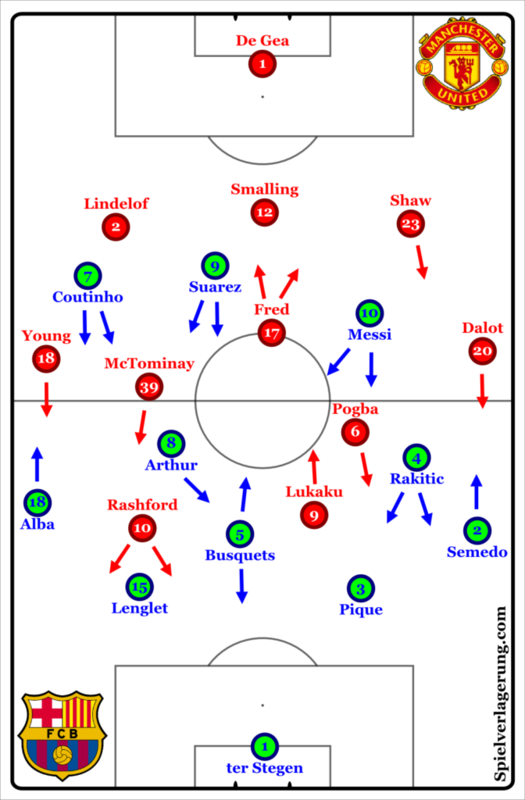 Particularly against Barcelona’s right side, the United midfield were highly ball-oriented which, along with one of the half backs (Shaw & Lindelof) pushing up, effectively reduced space for Messi’s dribbles. United’s defensive line remained high, denying room centrally between them and the midfield. Furthermore, with their back 5, there were limited spaces around their defence. Logically then, the main spaces were behind the United defence, but with their severe lack of depth, Barcelona were usually unable to access these. The opening goal actually came from a highly rare moment of a central run behind United’s defence. 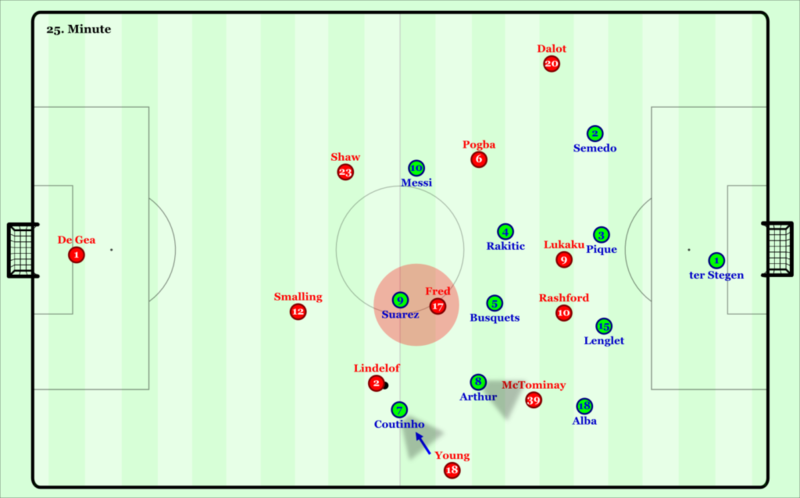 In the minutes after the goal, Solskjaer’s side began pressing higher, forcing a quicker possession rhythm from their opponents, and in the process forcing a more transitional game. Pogba now moved higher into a central 10 position, aiming for better access to the 6 space, allowing Rashford and Lukaku to press higher against Pique and Lenglet. Young meanwhile, would move to press Alba earlier, leaving Lindelof to defend Coutinho behind him. With Pogba pressing higher, there was extra space available behind and outside McTominay and Fred, for Barcelona’s front three. Yet by blocking the shorter passing options for their opponents, United were able to force Barca to progress quicker with earlier passes into their forwards, and several plays broke down for them either with lost duels, or errors resulting from the speed they were forced into. Similarly, in transitional phases Valverde’s men often tried to use back passes to ter Stegen to start build-ups, but were unable to create passing options quicker than United could press him, and were thus forced longer. The home team could now enjoy more possession. 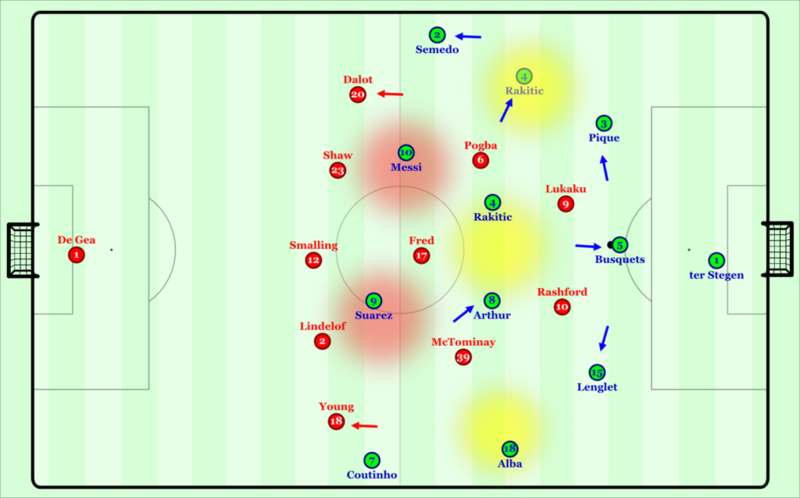 Against the ball Valverde’s men played in a 4-4-2-0 with little involvement from Messi, apart from staying high on the right, and directing United’s build-up to Lindelof & Smalling. Suarez focused on preventing Fred receiving in the 6 space, by constantly moving into the lane between him and the ball, or being close enough to intercept any attempts. Smalling thus had plenty of time on the ball, but was usually only able to play to Lindelof. From there, Coutinho looked for moments to press diagonally, blocking the pass to Young when Arthur was well positioned behind him to block the pass to McTominay. United were often forced back to De Gea from there, where they either played long or re-started very similar build-ups. United’s inability to progress from the time and space given to Smalling & Lindelof exposed huge flaws in their build-up understanding. Supporting dribbles: Logically, given the space in front of him, Lindelof would attempt to dribble forwards. Yet to make this effective, he needed a supporting team-mate who could access the space behind Coutinho. United however, lacked such movements forcing Lindelof to play backwards. Movement of “free man”: With Coutinho pressing Lindelof diagonally, Young was usually the so called “free man”, yet instead of holding his position, he at times dropped deeper on the wing, meaning even if he could receive a wall pass, he wouldn’t be able to break away from Coutinho easily. Support structure for lay-offs: When Lindelof was able to play forwards, there were either slow or non-existent movements to offer lay-off options. The home team’s attempts to create chances revolved heavily around creating conditions on the wings to cross. This was mainly done through playing into the feet of one of the forward players, often Lukaku, Pogba or McTominay, drawing Barcelona’s midfield line narrower, before laying it off and finding one of the wing-backs. One of the highest central 4 players would usually move wide to help send crosses. When Young had the ball on the wing, McTominay usually ran behind Alba, which had the effect of pinning Lenglet from following Rashford’s dropping movement. On the left however, Dalot was often isolated with his clearest support mostly in the form of back passes to Shaw. When they did cross, they mostly aimed for far post-areas with the likes of Pogba, Lukaku and even Dalot attacking this zone. Barcelona defended these situations excellently, with the vast majority of United’s cross attempts either blocked, or headed away comfortably in the box. Alba and Semedo consistently denied Young and Dalot space on the wings, moving out and often arriving to press by the time their opponent received the ball. This immediately reduced the available angles for the crosses, in particular blocking the cut-back zone. The channels inside them were covered well by Coutinho and Rakitic, although United hardly ever threatened these spaces. This was key since the defensive line dropped quite deep, severely reducing the space between them and the goalkeeper, making lofted crosses far more likely. This deep positioning allowed Pique and Lenglet to deal with these crosses facing away from their goal and in relatively static situations. Red area indicates congested space between Barca defence and GK. Blue indicating open cut back space, which Alba blocks with his cover shadow. The early stages of the second half followed a very similar pattern to the end of the previous period. United had the majority of possession, and persisted with their cross focused approach, yet the aforementioned issues against Barcelona’s deep defending became even clearer. However, after around 15 mins of the second half, with United’s intensity against the ball reducing, the away side were able to regain control. Facing a slower press, Barcelona could easier recognise the free spaces within and around United’s structure, particularly in the 6 space. At this stage, they were clearly focused on control as they sought to see out the game with possession. With the subs of Vidal and Coutinho, the Catalonians played in a 3-1-4-2 in possession, with Vidal in a balancing role as a left 8, covering room behind Alba. Roberto was a crucial sub, adding more depth to their attacks allowing Semedo to remain deeper. This structure also gave extra options for deep build-up with Roberto and Vidal often open in the half spaces against United’s 4-3-1-2 pressing attempts. To effectively block Barcelona’s short options, United left themselves without cover in front of the defence, Messi and Suarez adjusted well to receive in these areas. With Lukaku subbed off, United lost presence for their aerial crosses, yet continued attempting them. The score, total of 3 shots on target (for both sides) and severely low xG scores can be simply summarised by: one team didn’t really try to attack, and the other didn’t do so well. The crucial aspects of the second leg will likely be closely related to the factors of this game. Particularly key will be whether United can improve their final 3rdapproach, to better exploit the space offered by Barcelona’s defence. On the other hand, whether Barcelona can effectively add depth to their attack, and better play through United’s high pressing attempts (if they attempt it) will likely be decisive.